As triathletes gear up for his/her upcoming races this season, it is important to note that training times and sessions may become affected as a result of overuse and/or over-training. Cycling is usually the longest part of any triathlon leg and understanding as an athlete how you can be more efficient in speed and/or mechanics is vital to your success during your race this season. This post will address how you can increase not only your efficiency, but also one’s time to reduce fatigue and injury while improving productivity on your bike. 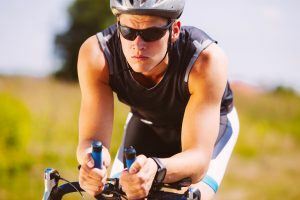 When it comes to speed and efficiency, cyclists who have trained for various races understand their body well, but new cyclists entering the duathlon or triathlon circuits may not have as great an understanding. Determining the bio-mechanics, or movement patterns, of how one moves when you cycle is critical. Sports chiropractors certified in Active Release Techniques (ART) analyze mechanics and understand cyclists patterns to determine if it is a weakness issue in your hip or knee leading you to develop pain. ART providers have worked with IronMan triathletes for many years understanding how athletes can stay healthy and move better to complete their races. ART improves flexibility, mobility, and function by breaking down adhesions/scar tissue formed from overuse and/or repetitive movement. Often, ART providers identify areas of weakness and restriction through a thorough exam and analysis of gait. In the cases of cyclists, having videos of any practice sessions makes it even more helpful to analyze mechanics. ART not only can help you stave off injury, but increase your speed and minimize injury recurrence by properly treating the correct soft tissues and lengthening them. It may take a few treatments for you to see a difference in your training, but once the correct tissues are identified as weak and strong, a recommended course of treatment will allow you to remain training without potentially missing time due to injury. Rehab exercises alongside ART will help you to stay healthy because you can strengthen what is weak/inhibited, and reduce any muscle tension and/or stiffness in the affected muscles, tendons, or joints.